In China, five unsuspecting people were waiting at a bus stop ready to greet the new day with open arms when a sinkhole opened up and swallowed them whole. At this time it is still unknown as to what actually caused the sinkhole, but a ten foot deep chasm opened up on the sidewalks of Beijing without warning. Fortunately nobody was killed in the freak occurrence, but all but one of the victims sustained injuries from the harrowing fall. A video surveillance camera monitoring the bus stop caught the whole nightmare on tape and you can clearly see the fifth victim clinging onto a newly unearthed water pipe just below the surface where the sidewalk used to be. All five victims were pulled form the pit by fast-acting good Samaritans. 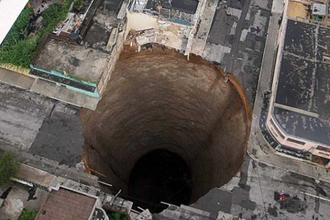 More and more sinkholes have been popping up around the world lately causing people to start questioning the very safety of the ground they walk on, there have even been talks that these strange occurrences are the first signs of a coming apocalypse or maybe something as simple as erosion. Well, Satan just wanted to say ,,hello”.